Main Attractions: Nature sanctuary, historical cottage, wishing well, meadows, secluded woodlands. It's up in the wilds of Peru, aptly named for its 2,043-foot average elevation, highest in the state. Here you can find total solitude, tranquility and unspoiled beauty. 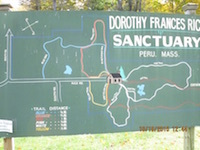 Dorothy Frances Rice Sanctuary is nearly 300 acres of woodlands, meadows and a pond for everyone to enjoy. Decades ago, it was used for several years as a research headquarters and summer residence for several Smith College students. Smith College is in nearby Northampton. The sanctuary was established in the late 1920s on property owned by Oran Rice, a New York City architect, and his wife, Mary, to honor their daughter, a recent Smith College graduate who had succumbed to tuberculosis. 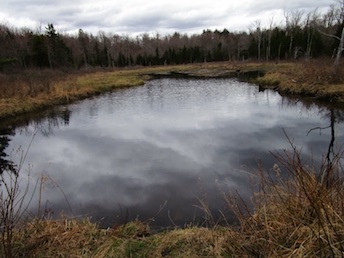 Dorothy Frances loved this land, the site of her family's summer home. After Oran Rice died, his widow set up a family trust to preserve and maintain the land, which was donated to the New England Forestry Foundation in 1974, along with a maintenance fund for the trails and the caretaker's cottage. The family's summer home within the preserve had been destroyed by fire and later was demolished. After a brief walk on Rice Road into the property (the road is closed to vehicles), a clearing reveals the former caretakers cottage, a wishing well, and an array of trail maps nearby. A notebook invites visitors to record their observations of flora and fauna. There are six colored trails well marked and maintained by three volunteers. The red, white, orange, blue, yellow and pink trails are clearly marked with signs and arrows, so there's no way to get lost, even though the wilderness area feels remote and isolated. The well-detailed maps at the gate and the cabin area aid in navigating the trails, each of which is a half-mile to one-mile long. Visitors can sample the preserve in an hour, or spend a morning or afternoon hiking all the trails. The Red Trail also honors the late Stephen J. Phillips, a Peru resident (1947-1995), who had served with distinction in the U.S. Navy during the Vietnam War. A short path leads to a plaque flanked by small American flags. What better memorial for a loved one than to preserve land and open it for public enjoyment? Please note: The directions were provided by a resident on this street. They often deal with stressful situations regarding parking and trail access. In the spirit of good sportsmanship please take the following advice from the neighborhood to heart for the sake of those that live there. Thank you! "This is a residential street that narrows towards its end and becomes a private driveway. The parking is limited to two or three cars off the road on the right. On the weekends it is best to park around the median in the block before where the road becomes two-lane again at Pershing St. Otherwise it is very difficult to turnaround and cars and private property have been damaged in the process. The trailhead is accessed by walking to the end of the street then on the right side of a split rail fence along the edge of Notch Brook. The residents request no gathering at the trailhead. This is our neighborhood, not a public parking lot."